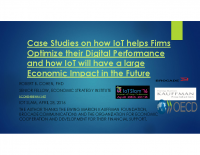 Using several case studies and quantitative analysis, this talk offers examples of how businesses are using IoT to improve their performance and optimize digital operations. It also explores how moving to IoT pushes firms to become more involved with analytics for big data lakes and delivering software upgrades through using enhanced workflows, such as DevOps and Continuous Service Delivery (like Netflix and Amazon). The talk also explores how much industries such as finance, healthcare, aircraft and autos plan to invest in IoT over the next decade. It describes what this is likely to mean for revenues, economic growth, labor productivity and jobs. Robert Cohen is a senior fellow at the Economic Strategy Institute where he heads a new study, “The economics and business impacts of the “New IP,” on cloud computing, SDN, NFV, big data and the Internet of Things. This project will evaluate whether cloud computing and the concomitant reorganization of the workplace will result in revenue gains, productivity improvements and employment and output benefits. In pursuing this analysis, Dr. Cohen is also evaluating corporate cases for the OECD’s digital data innovation initiative and contributing to the Ewing Marion Kauffman Foundation’s work on entrepreneurship and jobs. He is a participant in the Innovation for Jobs organization headed by Vint Cerf and David Nordfors. 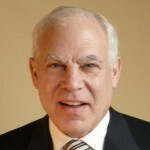 Dr. Cohen has previously served as Director of TM Forum’s Enterprise Cloud Leadership Council. He created New York State’s first high tech strategy and has consulted to the European Commission’s Directorate General XIII on the internet and economic growth. He is a past president of the Forecasters Club of New York. Dr. Cohen holds an MA and Ph.D. in economics from the New School for Social Research and a BA from Swarthmore College. He is the author, co-author or co-editor of five books. View the material on a computer or mobile device for a set period of time per your subscription level. IoT Slam does not grant you any other rights in relation to this material. In other words, all other rights are reserved.